I have been living near Davis Square with my family for close to 15 years now and chances are I have witnessed some of the very first HONK! Festival events. Over the years we watched (or sometimes just heard) the bands play in Davis Square or parade down Mass. Ave on the way to Harvard Square for the annual HONK! collision into Oktoberfest. 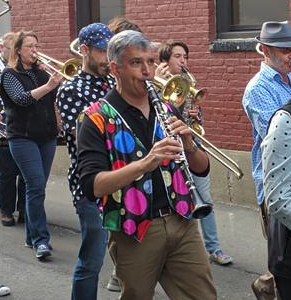 The sounds and sights of New Orleans style street bands were always a favorite of mine and admittedly, I was a band geek in high school, so I wondered if there was a way to audition for one of those bands. After a little searching I came across the School of HONK. I was surprised to learn that they are an open group accepting members at all skill levels. I attended my first session and everyone I met was welcoming and eager to help. Needless to say, I started in earnest during the Fall of 2017 and I now look forward to the Sunday sessions every week. I must admit that wearing polka-dotted attire, shouting out, and grooving to the music was not always within my usual comfort zone, but it is now. If you are looking for a musical outlet and love the intoxicating sounds of sousaphones, trombones, percussion, and reeds then the SoH is for you. All you need is to listen, learn, and most importantly, have fun.